A Virginia Tech team won an award recently from the Pacific International Space Center for Exploration Systems (PICES) for their sustainable plan to build super-durable bricks out of moon dust (MSNBC). 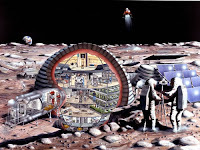 The process is pretty simple: mix moon dust with ground up aluminum (possibly from landing craft that would otherwise be junk) and charge it with electricity. This is similar to a process used to make armor for tanks, so the resulting bricks could withstand a meteor strike. If the bricks are shaped like an igloo's, "no nails, no cement would be necessary to hold it together… he shape of the bricks will do that."